LOCATION.--Lat 42°23'50", long 74°27'02" referenced to North American Datum of 1983, Schoharie County, NY, Hydrologic Unit 02020005, on left bank at downstream side of bridge on State Route 990V, 0.2 mi west of village of Gilboa, 0.5 mi downstream from dam on Schoharie Reservoir, and 0.8 mi upstream from the Platter Kill. PERIOD OF RECORD.--October 1975 to current year (since October 1983, discharges only for days of Schoharie Reservoir spill and since October 1989, discharges only for days of mean flow exceeding 10 ft³/s). GAGE.--Water-stage recorder and crest-stage gage. Datum of gage is 939.56 ft above NGVD of 1929 and 938.97 ft above NAVD of 1988. Prior to Aug. 29, 2011, at site 200 ft upstream at same datum. REMARKS.--Entire flow, runoff from 315 mi², except for periods of spill, diverted from Schoharie Reservoir through Shandaken Tunnel into Esopus Creek upstream from Ashokan Reservoir for water supply of City of New York. 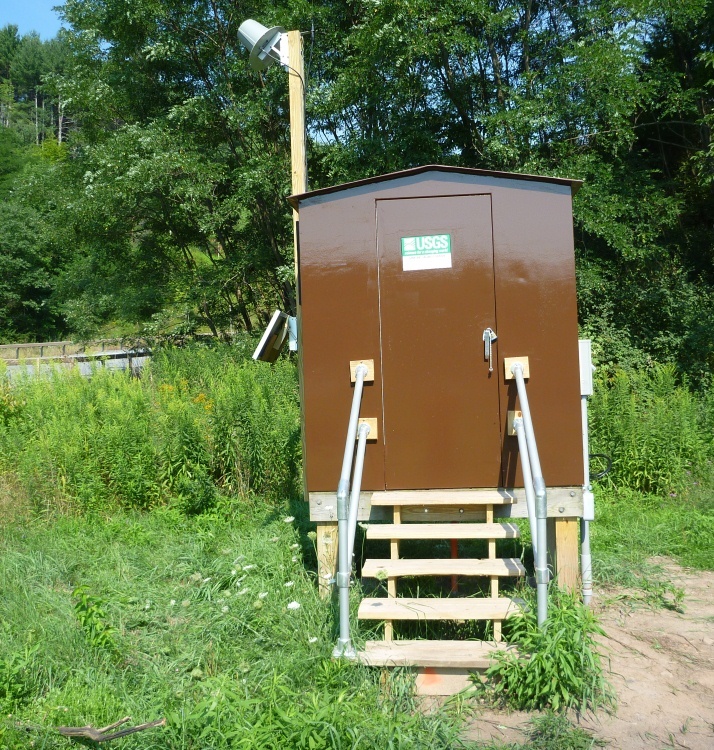 EXTREMES FOR PERIOD OF RECORD.--Maximum discharge, 111,000 ft³/s, Aug. 28, 2011, gage height, 40.52 ft, from floodmark at site then in use, 32.34 ft, from floodmark at present site, from rating curve extended above 22,000 ft³/s on basis of flow-over-dam measurement of peak flow; minimum daily discharge, 0.04 ft³/s on many days, June to October 1976, and Sept. 11-13, 1980, but may have been lower since October 1983 (see PERIOD OF RECORD); minimum instantaneous discharge not determined. EXTREMES OUTSIDE PERIOD OF RECORD.--Maximum discharge, about 65,000 ft³/s, Oct. 16, 1955, by computation of flow over dam; flood of Mar. 18, 1936, reached a discharge of 32,000 ft³/s, from information furnished by Bureau of Water Resources Development, City of New York. DISCHARGE <10 cfs NOT DETERMINED AT THIS STATION.